A week ago, while travelling in Hokkaido, Japan, I found an interesting stamp sheetlet on sale at the Sounkyo Onsen Post Office. 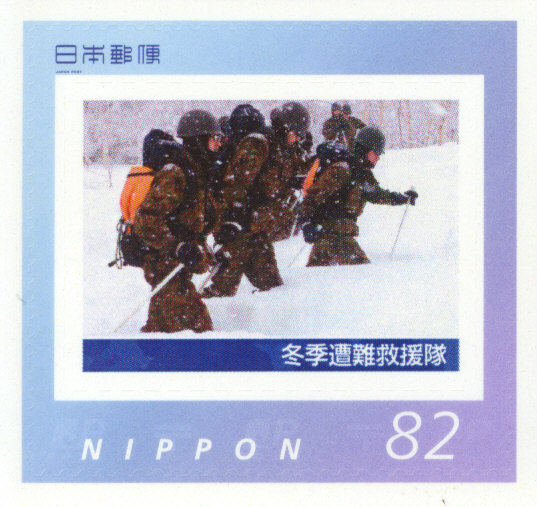 It consisted of a set of ten self-adhesive stamps on a minisheet issued by Japan Post ( 日本郵便 Nippon Yubin ) commemorating the 60th Anniversary of the Kamifurano Garrison of the Japan Ground Self-Defense Force ( JGSDF ). The total face value of the ten stamps of ¥82 each came up to ¥820 but the sheet sells for ¥1230 ( US$10.23 at today's exchange rates ). 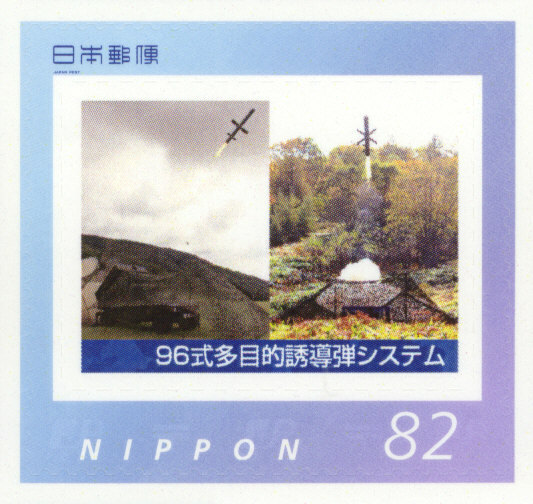 The stamps depict the various weapon systems of the garrison including tanks, howitzers, multiple launch rocket system, anti-ship guided missile and its search radar and the mountain rescue team. As an avid stamp collector, I immediately grabbed it. I had wanted more but the post office counter staff told me it was the last piece on sale. I am somewhat familiar with the special stamp issues by Japan Post since the schedule is published at its official website but knew nothing about this particular stamp sheet. Today, after some research, I discovered that this commemorative issue is a limited edition release of only 1000 sets by the Hokkaido division of Japan Post. It is only available for sale at various major post offices in Hokkaido from 8th Jun 2015. It also prompted me to want to learn more about the JGSDF and its activities in Hokkaido. The Japanese Self-Defense Force is formed after Japan's defeat in World War Two to provide a self-defense capability against foreign aggression. The post-war constitution only allowed the formation of a self-defense force and specifically prohibited the military from acquiring any form of offensive capability. Even the Japanese defense industry is not spared from such restrictions such that they can only manufacture and sell their weapon systems to the self-defense forces and cannot export them to foreign nations. Only now, on the brink of a potential submarine sale to Australia that some of these regulations are being revised. As usual, the Japanese self-defense forces are made up of the three services equivalent to the air force, navy and army of other nations - Japan Air Self-Defense Force ( JASDF ), Japan Maritime Self-Defense Force ( JMSDF ) and Japan Ground Self-Defense Force ( JGSDF ). In the Japanese language, JGSDF is known as the 陸上自衛隊 ( Rikujo Jieitai ). They are a formidable force with advanced weaponry and career soldiers who are professionally trained. They have garrisons all over Japan and such camps or stations are known as Chutonchi ( 駐屯地 ), literally meaning a place where troops assemble and where materials are stockpiled. 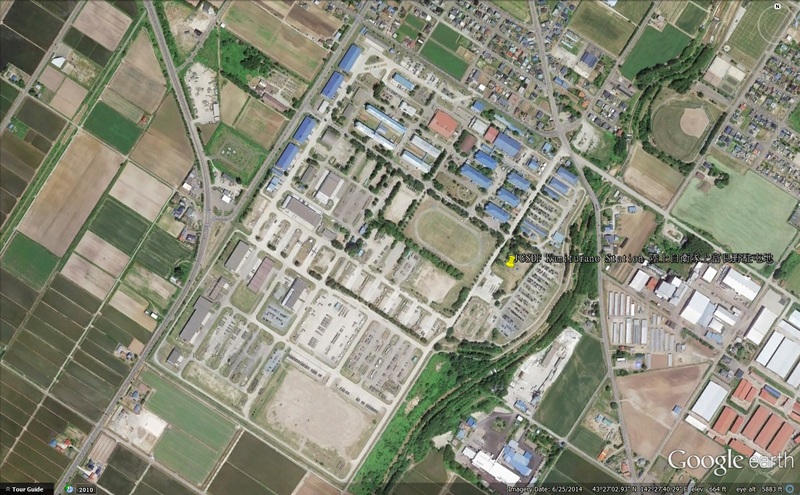 Such military camps are usually named after the ward or town where they are located. So in this case the JGSDF Kamifurano Station is located in the Kamifurano Ward ( 上富良野町 ), Sorachi County ( 空知郡 ), Hokkaido ( 北海道 ). First a little introduction on the Furano ( 富良野 ) region of Hokkaido, the northern most part of Japan. Furano City ( population 23017 ) is actually located right at the centre of Hokkaido such that it is also known as the Navel of Hokkaido. It is an extremely picturesque area of broad rolling farmlands with winding rivers surrounded by a series of mountain peaks including the Tokachi Range ( 十勝連峰 ) of the Daisetsuzan National Park ( 大雪山国立公園 ). The Furano area is most famous for the melons and lavender flowers that are grown in many of the flower farms. Every summer, throngs of tourists visit Farm Tomita and other nearby flower farms in Nakafurano ( 中富良野 ) to witness the flowers in full bloom. It is also a wine producing region with the Furano Winery researching and producing Furono Wines since 1972 and the Ikeda Grape and Wine Research Station producing the equally famous Tokachi Wines. 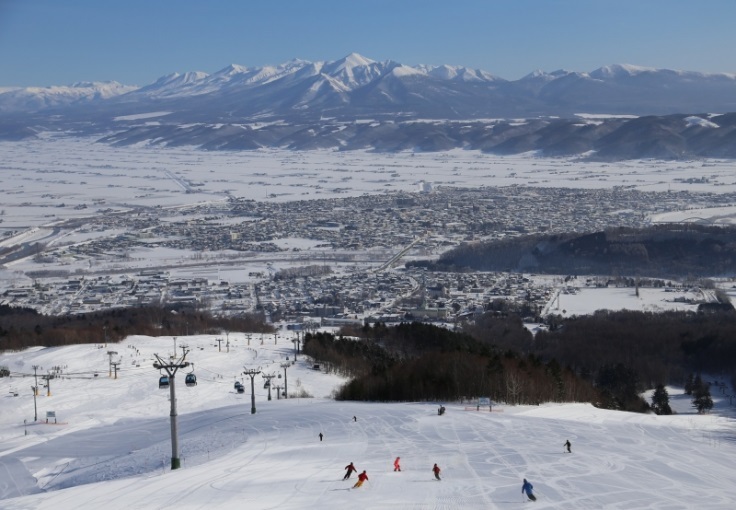 In winter, the Kitanomine ski fields adjacent to Furano City becomes a winter sports paradise. Kitanomine is much smaller than Niseko and have yet to be invaded by foreigners. Furano is also known as the Navel of Hokkaido. Hokkaido is the northernmost of Japan's 4 main islands. 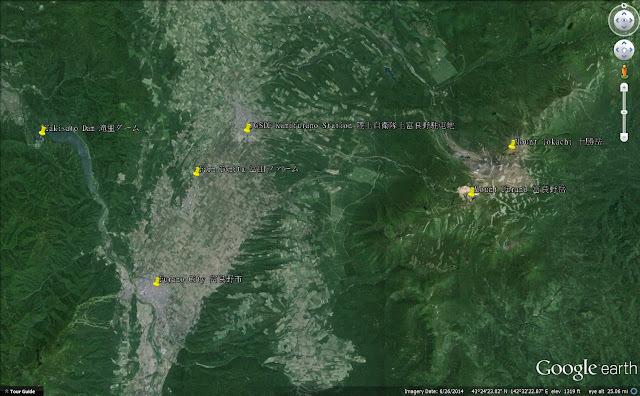 Top right is Sakhalin Island of Russia. 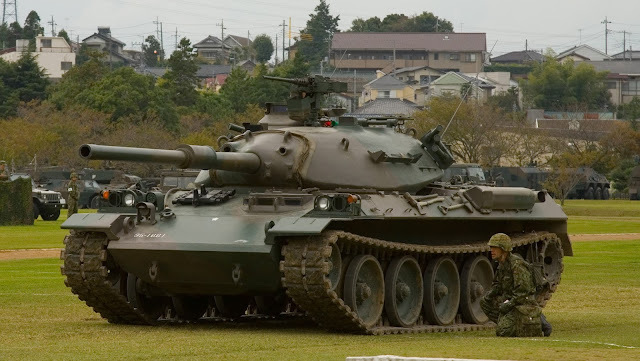 The JGSDF currently has in its inventory three different generations of main battle tanks ( MBT ) beginning with the Type 74 which was produced from 1975, the Type 90 which was produced from 1990, and the latest 4th generation Type 10 which was produced beginning in the year 2010. The first generation Type 61 MBT had already been retired from service in the year 2000. Incidentally, all three types of MBTs are stationed at the Kamifurano Garrison. They form the JGSDF 2nd Tank Regiment ( 第2戦車連隊 Dainisensharentai ) whose parent unit is the JGSDF 2nd Division Northern Army ( 第2師団 Dainishidan ) based in Asahikawa. The Regiment has five squadrons with Squadrons 1,2,3 and 5 fielding the older Type 74 and Type 90 MBTs while Squadron 4 is the sole operator of the newest Type 10 MBT. Of the three MBT types, the Type 74 is the most numerous with a total of 893 built. The Type 90 came in second with 341 units built, the production run being cut short due to the end of the Cold War and budgetary constrains. The Type 10 had just entered production 5 years ago and numbers are still building up with 66 units completed by 2014. It is meant to be the replacement for both the Type 74 and 90. 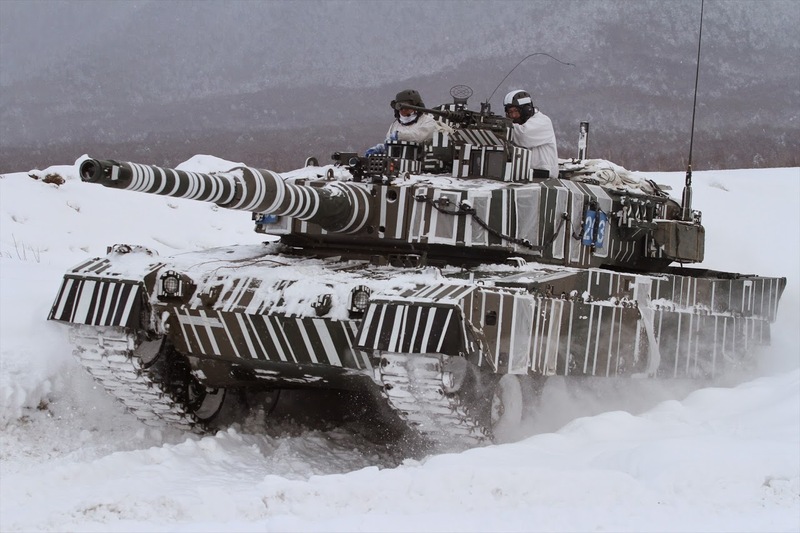 The broad open rural areas of Hokkaido offers the armour regiments lots of maneuvering spaces unlike the other regions of Japan which are either too mountainous or highly urbanized. This is the main reason why all three MBT generations are found at the Kamifurano Station. A second generation JGSDF Type 74 MBT on display in a photo dated 2007. Note the rounded turret common during the sixties similar to the Soviet T-62. in maneuvers. They are also known as the White Horse Regiment. 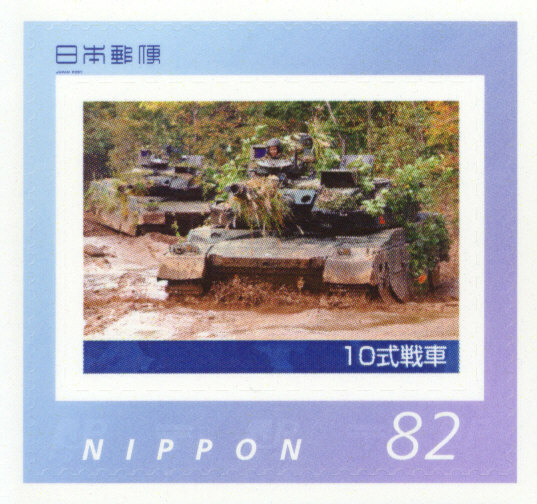 The Type 90 MBT of the 2nd Tank Regiment, JGSDF 2nd Division Northern Army. 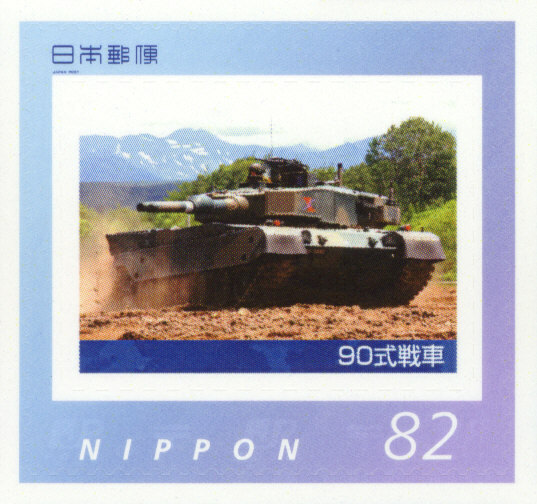 Also known as the Kyu-Maru Shiki Sensha ( 90式戦車 ), the Type 90 MBT was meant to counter the Soviet T-72 MBT. It was designed and built by Mitsubishi Heavy Industries and has a licence produced Rheinmetall L44 120mm smoothbore cannon with automatic loader. This same gun system is found in the German Leopard 2, the South Korean K1A1 and the US M1A2 Abrams MBTs. It is also armed with a 0.5 caliber M2 Ma Duece Browning heavy machine gun and a co-axially mounted 7.62mm general purpose machine gun. 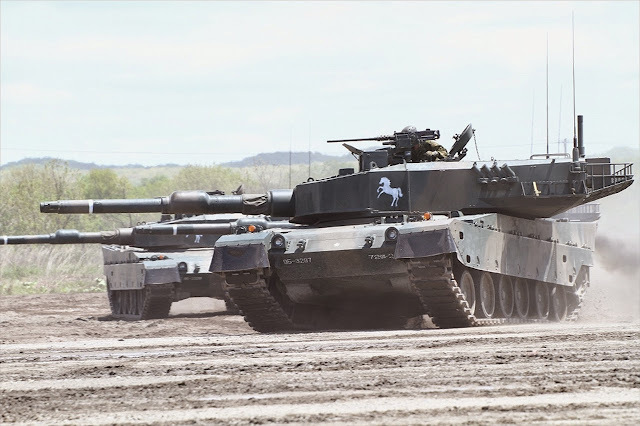 The Type 90 weighs about 50 tonnes and is rather boxy looking. 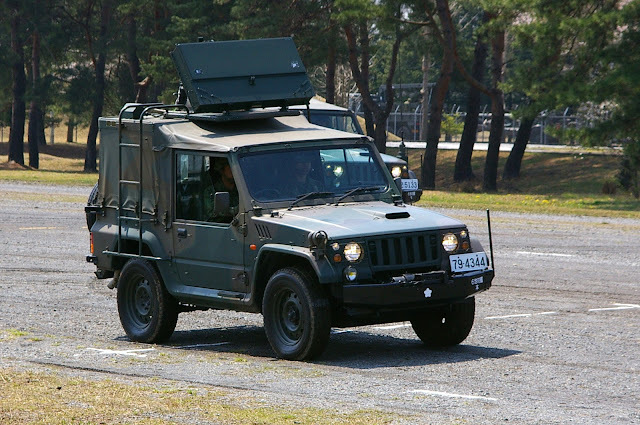 It is the central pillar of the JGSDF armoured divisions until enough of the newer Type 10s are available. The older Type 74s were already obsolete even before the Type 90 was produced. The Type 10 MBT of the 4th Squadron, 2nd Tank Regiment, JGSDF 2nd Division Northern Army. The Type 10 MBT is also known as the Hito-Maru Shiki Sensha ( 10式戦車 ) in Japanese. 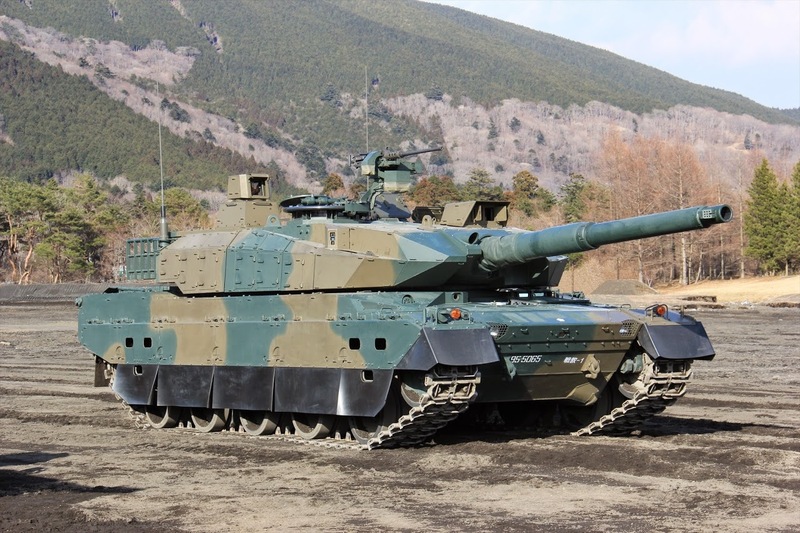 It is Japan's latest generation MBT manufactured by Mitsubishi Heavy Industries that is constructed from nano-crystal steel and has composite armour. It has a newly developed 120mm smoothbore main gun by Japan Steel Works and weighs 44 tonnes. It is powered by a 1200hp V8 diesel engine and has continuous variable transmission that allows the tank to achieve maximum speeds of 70km/h both forward and in reverse! It is fully equipped with day and night sights and its C4I system is vital for the sharing of information and intelligence in today's network-centric warfare. neatly lined up in the snow with the Tokachi Mountain Range in the background. The US M-110A2 203mm Self-Propelled Howitzer ( SPH ) is a Cold War relic that could be used to fire conventional as well as tactical nuclear shells ( W33 and W79 ). 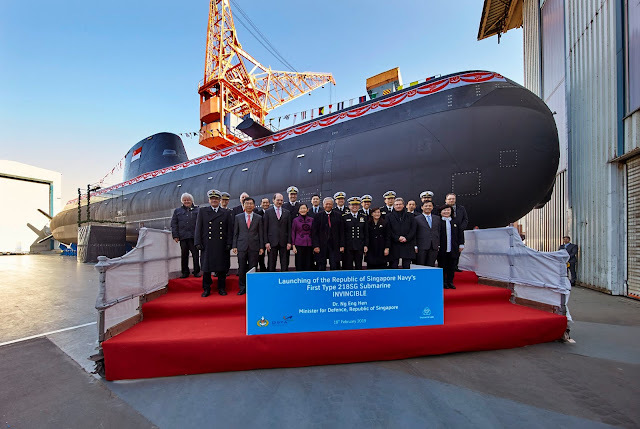 It has been retired from service by the United States and most of its NATO allies after the end of the Cold War but is still in the inventory of a few countries like Greece, Israel, Egypt and Japan. Its advantage in range over smaller caliber artillery pieces have largely been superseded by advancement in technology. They might be old but can still pack a tremendous punch especially when laying down barrage fire. They are known as the 203mm Jisouryuudanpou ( 自走榴弾砲 ) in Japanese. The M270 MLRS of the 4th Artillery Group, 1st Artillery Brigade, JGSDF Northern Army. The JGSDF's multiple launch rocket system ( MLRS ) is basically the US M270 tracked multiple rocket launcher licence produced by IHI Aerospace of Japan. 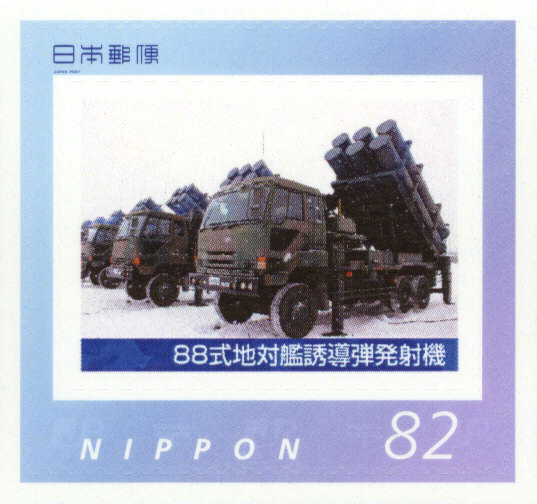 Since 1992, the JGSDF had progressively acquired 9 launchers annually until 2001 after which the acquisition rate fell to 3 vehicles per year till 2004 for a grand total of 99 M270 MLRS. 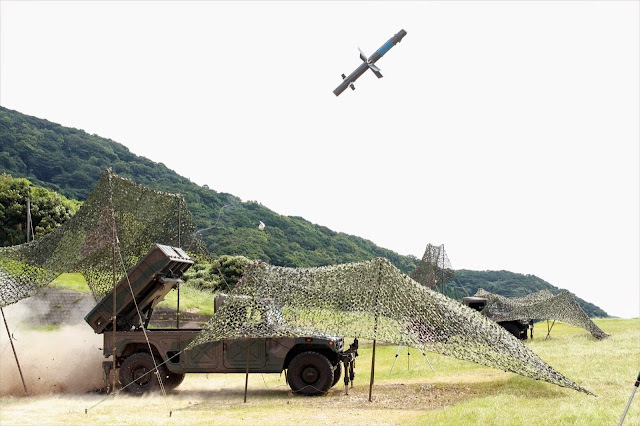 The M270 can fire either 12 unguided 227mm M26 rockets with various warheads or the GPS guided M31 GMLRS rockets which Japan started to procure in 2008. 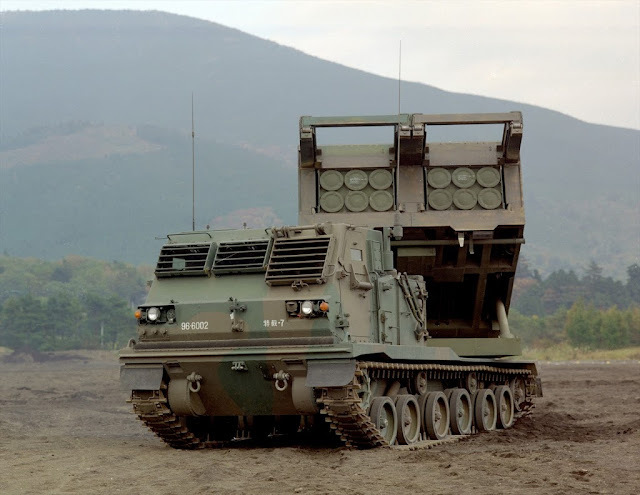 The MLRS stationed at Kamifurano belongs to the JGSDF 4th Artillery Group ( Machanized ) ( 第4特科群 ) whose parent unit is the JGSDF 1st Artillery Brigade ( 第1特科団 ) based at Kita-Chitose. 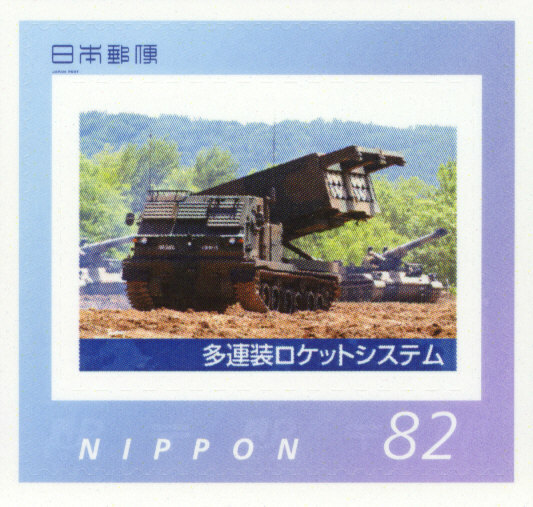 In Japanese, the MLRS is known as Tarensou ROKETTO SHISUTEMU ( 多連装ロケットシステム ). The JGSDF Type 88 SSM Transporter-Erector Launcher. The Type 88 SSM being fired from its TEL vehicle. The Type 88 SSM search radar. 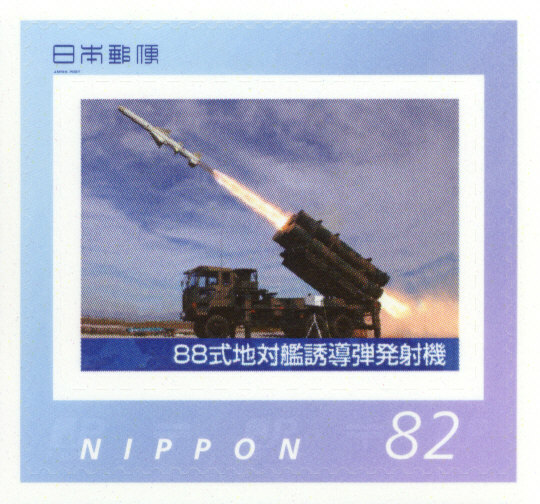 Evolved from the air launched Type 80 ASM-1 anti-ship missile developed for the JASDF in the eighties, the Type 88 SSM-1 is the ground launched version for the JGSDF. Manufactured by Mitsubishi Heavy Industries, this sea-skimming subsonic surface-to-ship missile has a range of 180km. It utilizes two solid fuel booster rockets during launch and a turbojet engine ( Mitsubishi TJM-2 ) for cruising at mach 0.95. The missile weighs 661kg, has a length of 5.08m and a diameter of 35cm. It carries a 225kg high explosive ( HE ) warhead. Guidance system is by inertial guidance ( INS ) with terminal active radar homing. A total of 6 missiles are being carried by each of the Type 74 heavy truck transporter erector launcher ( TEL ). They are usually fired from concealed locations within 100km from the coast against an invading enemy naval task force. 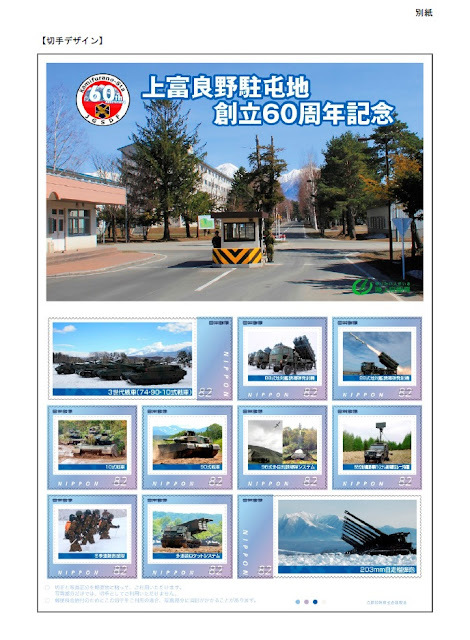 The JGSDF has 54 TELs in its inventory. The Type 88 has a similar capability as the Harpoon missile. An improved vertical launched INS/GPS guided version known as the Type 12 is currently being procured. 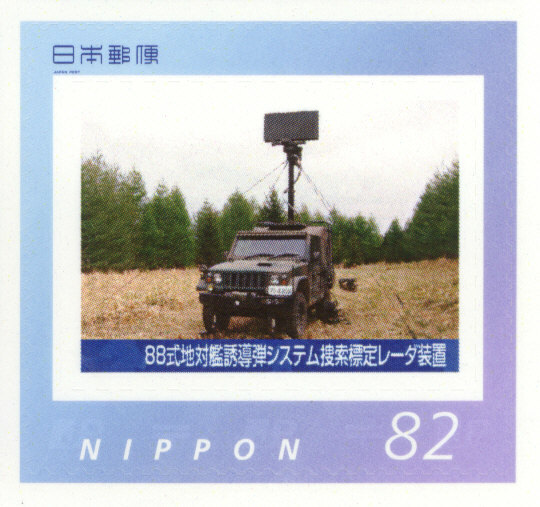 Also shown above is the JTPS-P15 Sentry Radar System mounted on a Type 73 1/2 Ton light truck. It is the search radar for the missile batteries. The Type 88s at Kamifurano Garrison belong to the 3rd Surface to Ship Missile Regiment ( 第3地対艦ミサイル連隊 ) whose parent unit is again the JGSDF 1st Artillery Brigade ( 第1特科団 ) of the 2nd Division Northern Army. JGSDF Type 88 SSM-1 TELs with 6 missiles each erected and ready to fire. 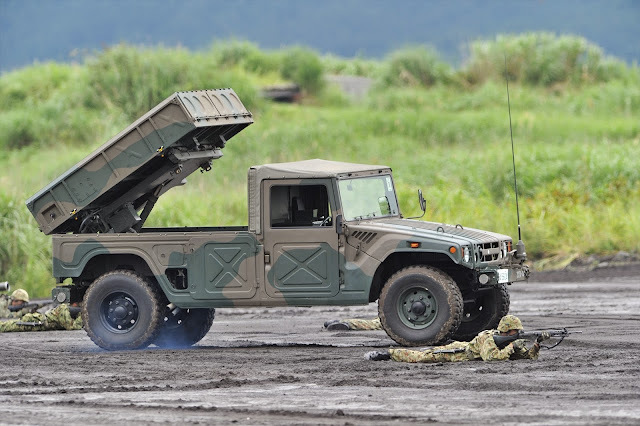 Photo JGSDF. The Type 96 Multi-Purpose Guided Missile System of the 2nd Ground to Ship and Anti-Tank Company, JGSDF 2nd Division Northern Army. The Type 96 Multi-Purpose Guided Missile is a medium range infra-red homing, optically guided missile for use against amphibious landing crafts and tanks. It can even be used against helicopters. Developed by the Kawasaki Heavy Industries from 1986, it took ten years before its first deployment in 1996. The missile is 2m long and has a diameter of 16cm. It weighs 60kg and is mounted in sets of six on a light utility vehicle as it is too heavy to be man portable. Its range is classified but is believed to be in excess of 10km and possibly up to 25km. Each battery will have 6 different vehicle types, an Information Processing Unit ( IPU ), a Fire Control Unit ( FCU ), a ground guidance unit ( GGU ), several launcher units ( LAU ), forward observation unit ( OPU ) and loaders ( LDU ). The unit at Kamifurano is the 2nd Ground To Ship and Anti-Tank Company whose parent unit is the JGSDF 2nd Division Northern Army. In Japanese it is known as the Kyuurokushiki Tamokuteki Yuudoudan SHISUTEMU ( 96式多目的誘導弾システム). Shizuoka Prefecture. 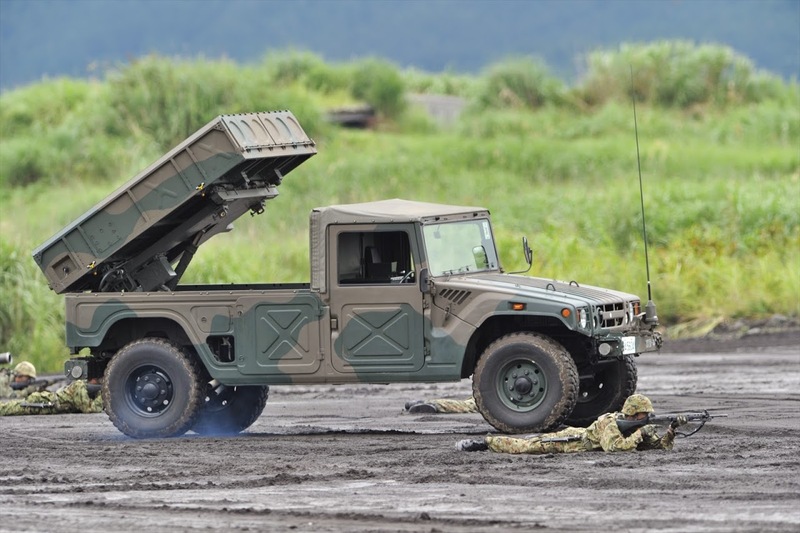 Photo : JGSDF. The Alpine Rescue Team of the Kamifurano Station during winter exercises. 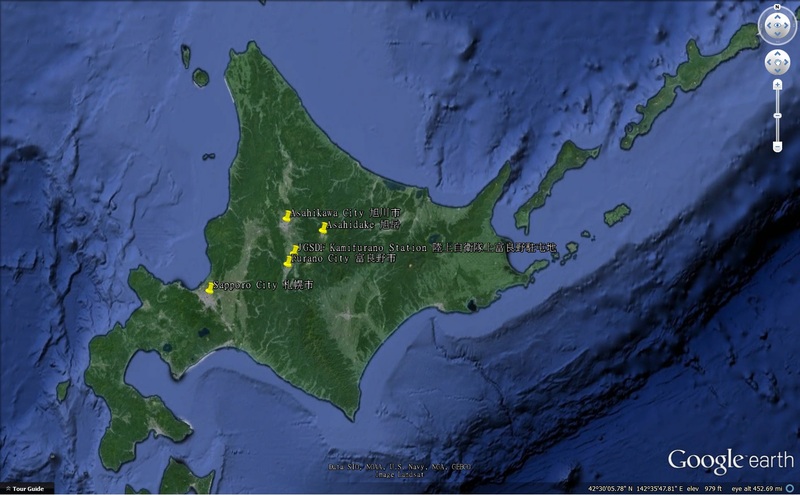 With the greater Furano region flanked by the active Tokachi Volcanic Group which included high peaks like Furonodake ( 富良野岳 1912m ), Bieidake ( 美瑛岳 2052m ) and Tokachidake ( 十勝岳 2077m ) and also Hokkaido's highest peak Asahidake ( 旭岳 2291m ) aka Daisetsuzan ( 大雪山 ) a little further to the northeast, it is only a matter of time before a serious incident occurs in the mountains especially during the winter season. 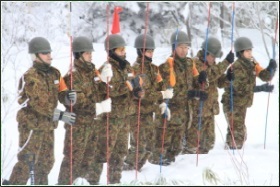 In fact, the JGSDF Kamifurano " Winter Disaster Rescue Team " was formed in 2008 following an avalanche accident that killed 4 people on Mt Kamihoromettoku (上ホロカメットク山 ) in 2007. Members of the rescue team train all year round to prepare themselves for the winter season. In Japanese, they are known as the Touki Sounan Kyuuentai ( 冬季遭難救援隊 ). JGSDF Kamifurano is located right at the door steps of the Tokachi Volcanic Group with peaks of 2000m or higher. Bird's eye view of JGSDF Kamifurano Station. It is amazing how much we can learn from a postage stamp, especially if one is willing to invest in a little extra research into the background and history of the stamp issue. The internet has made such efforts a lot easier. Writing about Kamifurano Station's 60th Anniversary had broadened my knowledge on the JGSDF and its activities in Hokkaido. In time to come, this limited edition stamp sheet will also appreciate in value, making its collection even more worthwhile. If you are interested to find out more about Japanese postage stamps, please visit Japan Post's website https://www.post.japanpost.jp/kitte_hagaki/index.html ( Japanese only ). 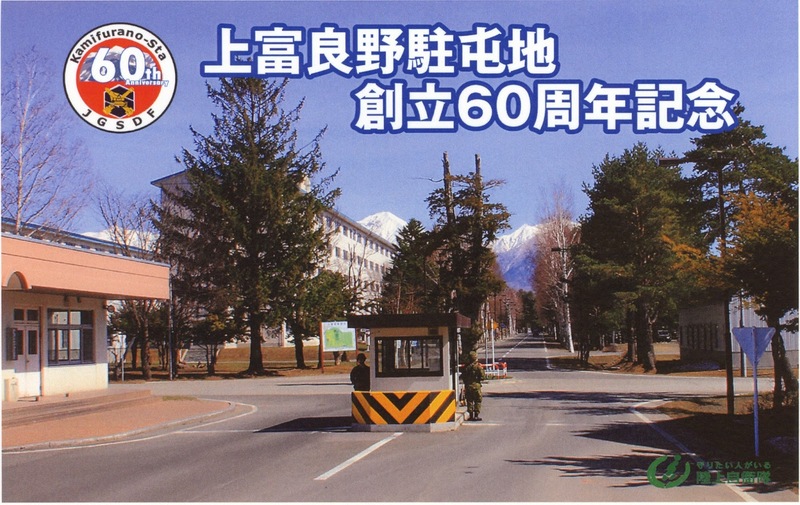 JGSDF Kamifurano Station 60th Anniversary Logo. JGSDF Kamifurano Station side entrance looking east with Tokachi Mountains behind.